Aurora D2L System - Gurtler Industries, Inc. The Gurtler Aurora D2L Mixing System is a fully automated dual tank system designed to provide consistent product mix for injection into your washers. Saves space: Dry products that are palletized for easy storage. No need for large liquid bulk tanks. 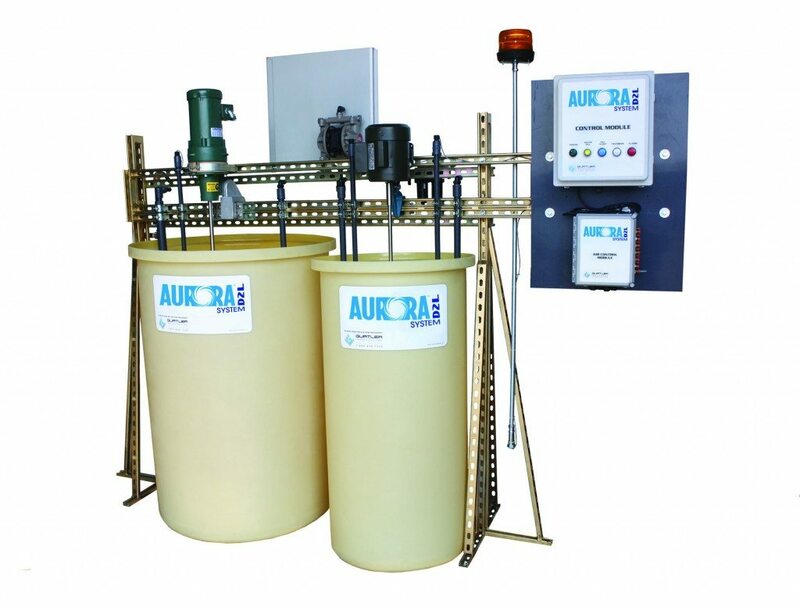 Saves space in the plant, as the Aurora D2L Mixing System has a small footprint. Great for plants with limited space for chemicals. Saves shipping costs: 100% active product eliminates the need to pay for transporting water. Low installation costs and time compared to installing bulk systems. Easily integrated with any liquid injection system for maximum flexibility and minimum transitions issues. With the Air Control Module, almost any washer control or liquid chemical injection system can easily control up to 11 washers or injection sites for tunnel washers, utilizing fast injection double-diaphragm injection pumps. Consistent product concentration for maximum quality. A dual tank system with separate mix- and use-tanks makes sure the product delivered to the washers is always the same concentration. Wash quality never varies from variable chemical makeup of product. Gurtlerâ€™s Aurora D2L product line is formulated to provide top-quality results across a wide variety of wash conditions, soils and fabric types. The Gurtler AurorA D2L Mixing System is fully automated utilizing Gurtler’s in-house engineered and programmed Control Module. This PLC-driven system is engineered to automatically sense when tank levels require action. Fully mixed product is automatically transported from mix- tank to the use-tank when the unit senses a low level. System safety and security are maximized with robust and reliable PLC technology, safety logic, and redundant sensors. The Air Control Module allows for easy control of air operated pumps to inject product from the use-tank to the washers. The unit provides up to 11 electrically operated solenoids for injection utilizing most pumping system or washer controls. This heavy-duty detergent has a high level of hydroxide/ortho-silicate alkalinity to break up difficult soils and saponify fats and oils for more effective removal. Excellent for restaurant textiles such as kitchen towels and chef coats. A unique blend of nonionic and anionic surfactants combines with alkaline builders for superior emulsification, soil removal and suspension. A complete one-shot detergent for maximum soil conditions. This medium-duty detergent is an economical choice for medium to light soil conditions. The hydroxide/ortho-silicated alkaline builders attack greases and oils and break up proteins soils for easier removal. Our special blend of nonionic detergents with the added benefit of anionic detergent is very effective across a wide variety of soils and is effective on cotton as well as polyester textiles. This concentrated builder is a blend of silicate alkaline builders with phosphate-based water and soil conditioners. An excellent choice as the alkali source for uniform laundries. Excellent petroleum grease and oil suspension and emulsification properties. Less aggressive alkalinity preserves the life of uniforms while maximizing soil removal. use with Power Forward or Power Drive for the best results. A unique built detergent designed for healthcare applications. Effective across a broad range of temperatures and especially effective at 100- 140°F. Enzyme-active for superior stain removal. Low alkaline detergency for gentle, but deep cleaning and longer textile life. High performance surfactants – EPA recommended non-NPE formulation. Fortified with phosphate builders with excellent soil removal and soil suspension properties for whiter whites and brighter colors.